At the invitation of Chancellor of the Federal Republic of Germany Angela Merkel and the Prime Minister of the Kingdom of Belgium Charles Michel and as agreed by China and the European Union, Chinese Premier Li Keqiang will pay an official visit to Germany and attend the annual China-Germany prime ministers' meeting, attend the 19th China-EU Summit in Brussels, and pay an official visit to Belgium from 30 May to 2 June. At the invitation of Foreign Minister Wang Yi, German Vice Chancellor and Foreign Minister Sigmar Gabriel will visit China on 24 May. Q: It is reported that the Iranian presidential election was held on 19 May and the incumbent President Hassan Rouhani was reelected. What is China's comment? A: President Xi Jinping has sent congratulatory message to Present Rouhani on his reelection. We believe under the leadership of President Rouhani, the Iranian people will achieve greater progress in national development. In recent years, China-Iran relations have enjoyed a good momentum with steady progress in practical cooperation in various fields. China highly values China-Iran relations and stands ready to work with Iran for better development of China-Iran comprehensive strategic partnership. Q: Philippine President Duterte said last week that the Chinese side said that if the Philippines tried to drill for oil in the South China Sea, then there would be conflict. Can you confirm that? A: I have noted that Philippine foreign minister just made remarks on that. China's position on the South China Sea issue has been consistent and clear-cut. China has always stayed committed to resolving the relevant disputes on the South China Sea through negotiation and consultation with the Philippines and other parties directly concerned. We stand for "shelving disputes and jointly developing" in a view to creating conditions for the ultimate solution of the disputes. Last week, the first meeting of the bilateral consultation mechanism between China and the Philippines on the South China Sea issue was successfully held in Guiyang, which marks an important step forward in the right way of properly solving the South China Sea issue through dialogue and consultation. This mechanism also provides an important platform for the two sides to manage differences and conduct cooperation. During President Duterte's visit to China, the two sides have exchanged in-depth views on the development of China-Philippines relations and other relevant issues. The two sides have agreed to strengthen communication on major issues concerning the development of bilateral relations, lead the sound and steady development of bilateral relations in the right direction of good neighborliness and friendly cooperation, deepen across-the-board cooperation under the framework of the Belt and Road initiative and promote common development and prosperity. Going forward, China wishes to work with the Philippine side to implement the consensus between the two presidents, properly resolve disputes through peaceful and friendly consultation,and continue to deepen and broaden practical cooperation in various areas for the continuous sound and steady development of China-Philippines relations and regional peace and stability. Q: The DPRK has confirmed the test launch of the Pukguksong-2 intermediate-range ballistic missile yesterday, adding the weapon was now ready to be deployed for military action. This has been the eighth missile test launch by the DPRK since this year. What is your comment on this? Has China asked the DPRK to refrain from taking actions that may escalate tensions through diplomatic channel? A: We have noticed the relevant move. China's position on this issue has been consistent and clear. The relevant UN Security Council resolutions have clear provisions on the DPRK's launch activities by using the ballistic missile technology. 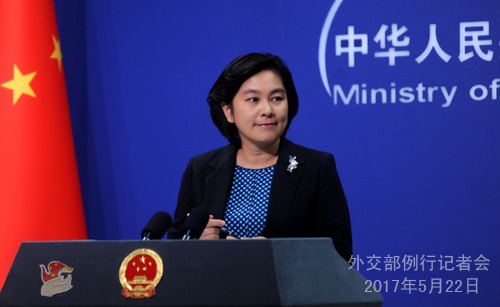 China opposes the DPRK's missile launch in violation of Security Council resolutions. Now the situation on the Korean Peninsula remains sensitive and complex, we again urge relevant parities to keep calm and restrained, avoid actions that may escalate tensions and stimulate each other, deescalate the situation and come back to the right track of dialogue and negotiation. China will also continue to make its own effort to this end. Q: The 73rd Session of The United Nations Economic and Social Commission For Asia and the Pacific (ESCAP) was just held in Bangkok, during which the China-proposed resolution of "advancing integrated and seamless connectivity for sustainable development in Asia and the Pacific " was adopted in support of the Belt and Road Initiative. What is your comment? What is China's vision for the cooperation with ESCAP under the framework of the Belt and Road Initiative? A: The 73rd Session of The United Nations Economic and Social Commission For Asia and the Pacific (ESCAP) was held in Bangkok from 17 to 19 May and Assistant Foreign Minister Qian Hongshan led a delegation to the meeting. During the meeting, participating parties appraised the important significance of the Belt and Road Initiative in promoting development in Asia and the Pacific and supported the synergy between ESCAP and the Belt and Road Initiative. 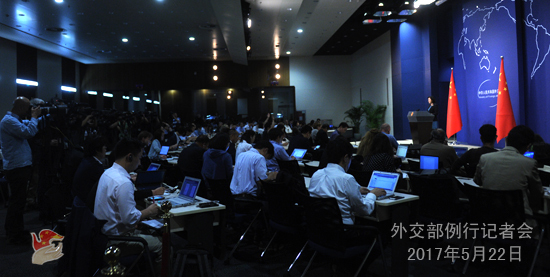 The session adopted the resolution of "advancing integrated and seamless connectivity for sustainable development in Asia and the Pacific " proposed by China, which appreciated the holding of the Belt and Road Forum for International Cooperation in Beijing, decided to promote connectivity through extensive consultation, joint contribution and shared benefits and carry out cooperation in such areas as policy coordination, infrastructure, investment, finance and people-to-people exchanges, and called on ESCAP to support the implementation of the Belt and Road Initiative and other cooperative initiatives. This again demonstrated the international community's positive attitude towards the Belt and Road Initiative. EASCAP is a UN regional cooperation body with the greatest coverage and influence. China wishes to work with other members of ESCAP to strengthen practical cooperation with countries in Asia and the Pacific in such areas as connectivity, regional economic integration and sustainable development, jointly promote the building of the Belt and Road Initiative, and make positive contribution to the development of the Asia-Pacific region. Q: The Chinese government has allegedly detained six Japanese citizens under suspicion of endangering national security. Can you brief us on that? What is the reason for their detention? A: According to my information, Chinese competent authority has legally investigated the six Japanese citizens suspected of involving in illegal activities and notified relevant Japanese consulate in China in accordance to the China-Japan Consular Agreement. Q: What is Chinese government's response to the New York Times' report that CIA operatives were arrested in China? A: I am not aware of the details of that report. But I can tell you that China's national security organ is investigating and handling organizations, personnel and activities that endanger China's national security and interests and fully perform its duty with the authorization by law. I do not want to say more about the normal performance of duty by the national security organ. Q: The plenary session of the NSG is expected to be held next month. Is there any change to the status quo about the admission of new members? Is any new initiative being contemplated by China and the rest of members about the admission of India and other non-NPT states? A: China's position on the admission of non-NPT states into the NSG remains unchanged. 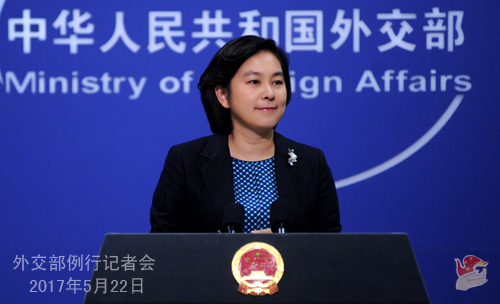 China supports the NSG in handling the relevant issue as mandated by the 2016 Seoul General Assembly with the principle of consensus and through the open and transparent intergovernmental process and the "two-step" approach. China will continue to take part in the NSG's relevant discussion in a constructive way. Q: What does China expect from the upcoming EU-China Summit in Brussels on June 1? What does China prepare to offer EU companies in terms of market access and investment? A: We have release information on Premier Li Keqiang's attendance in the 19th China-EU Summit in Brussels. During this visit, Premier Li Keqiang will hold the 19th China-EU Summit with President of European Council Donald Tusk and President of European Commission Jean-Claude Juncker, and they will exchange in-depth views on China-EU relations and other regional and global issues. Premier Li Keqiang and EU leaders will also jointly attend the China-EU Business Summit, China-EU Innovation Cooperation Dialogue,the signing ceremonies of agreements on SME cooperation, the China-EU tourism year and other activities. The current international situation remains complex and volatile with increasing uncertainties. China and EU are two important forces in the world and also comprehensive strategic partners for each other. We hope the stability of China-EU relations can help us cope with the uncertain factors in the international situation, and send to the outside world the positive message of China-EU making joint efforts to uphold multilateral system, oppose protectionism and ensure the economic globalization is developing in a more inclusive, mutually beneficial, equitable and rational manner. As for your concern on EU's market access and other issue, I should say China's development calls for reform and opening-up. We have stated solemnly many times that China's door of opening-up will never be closed and it will continue to expand its opening-up. We hope EU will work with China to create more convenient and favorable environment for expanding two-way investment and trade in the spirit of equality, mutual benefit and mutual respect. We hope our European friends can look at this issue in an objective and rational light. Q: There is another UN Security Council meeting tomorrow that might push for further sanctions on the DPRK. What would China's position be if they were to propose further sanctions? A: You are all following the situation on the Korean Peninsula closely. On the Korean Peninsula nuclear issue, the international community share three important consensus: the first is commitment to the goal of denuclearization, the second is full and strict implementation of Security Council resolutions and the third is peaceful solution of the Korean Peninsula nuclear issue. China maintains that the relevant resolutions and discussions should help the situation move towards this end. China will continue to fully implement relevant Security Council resolutions in their entirety and make efforts to cool down and deescalate the situation on the peninsula and properly resolve the issue through peaceful means. Q: Can you reiterate China's reaction to Taiwan being excluded from the WHO meeting for the first time in years because of some cross-Straits understanding issues? A: We have repeatedly stated our position. I think it is very clear why Taiwan cannot attend the WHA. The DPP authority refuses to recognize the 1992 consensus, which creates an obstacle for Taiwan's participation in that meeting. So the DPP authority is the one to blame. The World Health Organization (WHO) is a specialized agency of the United Nations and an international organization consisting of sovereign countries, which should follow the one-China principle under UN General Assembly Resolution 2758 and WHA Resolution 25.1. Since Taiwan is part of China, its participation in international organizations should be handled with one-China principle. Minister of National Health and Family Planning Commission Li Bin also introduced relevant information when giving an interview to media in Geneva yesterday. I would like to stress that the central government of China has made proper arrangements for Taiwan's participation in global health affairs in line with the one-China principle. Within the framework of the International Health Regulations (2005), there are unimpeded channels and sound mechanism for Taiwan to exchange information with the WHO and countries around the world. Experts from Taiwan can participate in WHO-related technical meetings while the WHO may also send experts to Taiwan for guidance when needed. These arrangements ensure timely and effective responses from Taiwan in case of public health emergencies either in Taiwan or in other places around the world.